Your position sounds like a dream job to many. What’s the most enjoyable aspect of your job? On the flip side, what’s the most challenging part of your role? 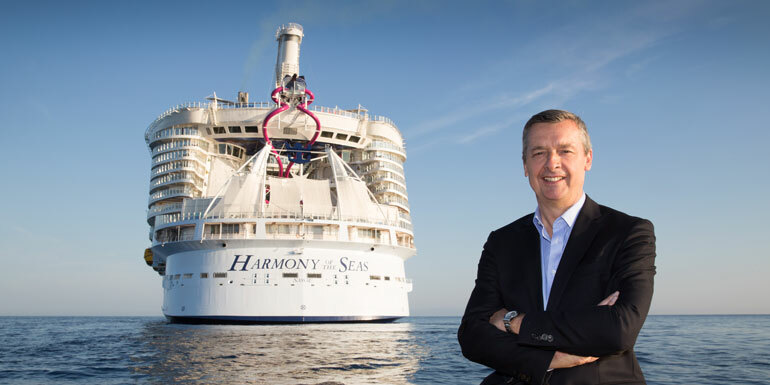 To be President and CEO at Royal Caribbean International is surreal. I started this journey 35 years ago onboard the Nordic Prince as Assistant Purser, and it’s been an exciting and humbling experience since day one. There are several aspects I enjoy: interacting with our guests, and working with our committed staff and travel agent partners. I’m very fortunate to be able to deliver great vacations hand-in-hand with many incredibly dedicated people who are on land and at sea, and from all around the world. As far as the most challenging part, it’s the commitment our entire company shares – to always challenge ourselves to set the trends and continuously raise the bar in the cruise industry. 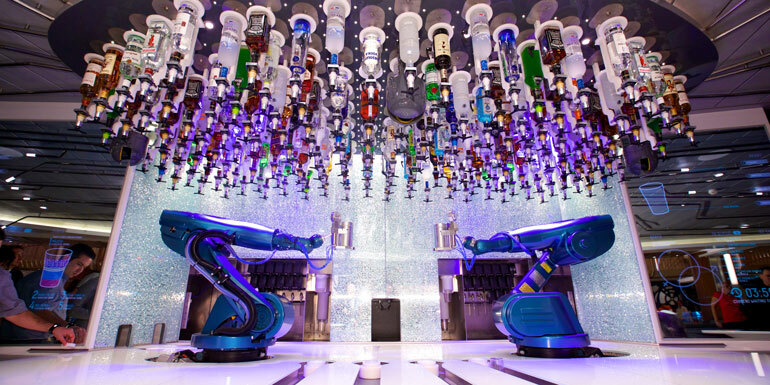 It’s in our DNA to innovate, and that keeps things quite interesting here at Royal Caribbean. What’s the biggest way cruising has changed since you started in the industry? Is there anything you miss about the “olden days” of cruising? Technology has made an incredible impact. From the smallest to the largest ships in the industry, the choice of experiences and amenities onboard modern-day cruise ships have transformed dramatically due to technology. Accommodations are spacious and feature modern conveniences for guests, distinctive restaurants take culinary experiences to a whole new level, the internet is as fast as it is on land, and the activities have transcended the expected with simulated surfing and skydiving, robotic bartenders, and an all-glass capsule that rises 300 feet above the ocean. Technology has been and will continue to be a game-changer for the industry. I don’t necessarily miss one specific aspect of the “olden days” of cruising. The industry has evolved with guest expectations, and every innovation, trend and style of cruising has had its time, and we’ve learned from all of it. I continue to look forward. How do you feel about user generated review sites like Cruiseline.com and Cruise Critic? How do they affect the customer experience? Do they impact how you do business? Guest feedback is important, that goes without saying. The question then is “How can we become more effective in the ways we gather and review feedback, as well as take action based on what we’re hearing?” The Internet, and most notably, social media, has changed the landscape and the way we do business forever. That’s why we welcome user generated review sites like Cruiseline.com and Cruise Critic. These are channels that help us open up the lines of communication with our guests, and help travelers in choosing the right cruise line for them. We’re even able to introduce new programs or make certain adjustments to others by using the sites to identify what’s the conversation and what really needs our attention. Do you think the average ship size will continue to grow, or we are going to see the return of smaller, more intimate ships? Cruise lines strive for differentiation among the variety of products out there. There always will be the lines that will offer guests the small-ship experience, and others like Royal Caribbean that focus on being the very best in delivering the large-ship vacation experience for families of all ages. We’ll see both sides of the industry spectrum continue to evolve in the years to come. According to a lot of reviews, Dynamic Dining seems to have been a rare misstep for Royal Caribbean. How did the execution of this concept that seemed like a great idea on paper go wrong? Innovation is in our nature, and when we introduced Quantum class, the Dynamic Dining program was yet another new experience that we designed to offer more flexibility and options across 18 different restaurants onboard. In reviewing comments from our guests, it was clear that they prefer ease and flexibility above extensive planning. We recently announced that we are moving away from Dynamic Dining in the next couple of months. Many great innovators have come up with big ideas that don’t always work out as intended. That’s how we keep raising the bar on the experiences we provide our guests. And while the Dynamic Dining program was not the right fit, we’ve come away with great learnings. Anthem of the Seas and Ovation of the Seas will transition to our popular MyTime Dining program during November 2016. 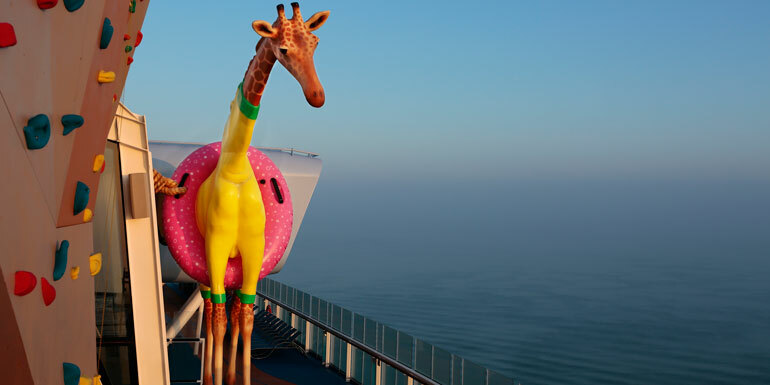 The larger than life animal sculptures on the Quantum-class ships have been a hit. What inspired you to add these unique art pieces? How are the animals and names chosen? Quantum class was unlike anything the industry had ever seen. The standout features we introduced were bold and unexpected statements, and we wanted the top decks to represent how unique the ships really are. With the industry’s first skydiving simulator – RipCord by iFly, the North Star and other first-at-sea features found on our Quantum-class ships, we were looking for a symbol just as unique as the company it was going to keep and something our guests could connect with. Many of our teams were involved in choosing the signature pieces. We even involved our ships’ crew, who named them, and we most recently held a contest for our China team members to name our favorite pandas onboard Ovation of the Seas. What are your hopes for cruises to Cuba now that the door is opening? Cuba is on our wish list. We’ve called Miami home for nearly 50 years; and with this island nation so rich with history just across the way, we’re excited for the potential opportunity to take our guests on yet another authentic Royal Caribbean adventure. Until then, we’ll continue to wait for the call with the various required approvals. What major changes do you see coming to Royal Caribbean and the cruise industry in the years ahead? What new technologies are you most excited about? We are continuously pushing the envelope, so you’ll have to wait and see! 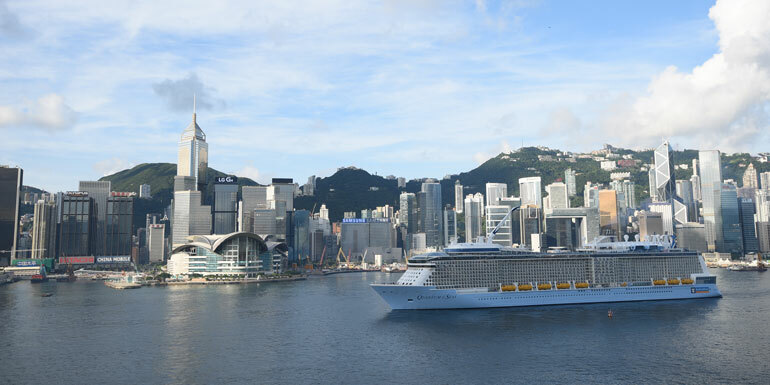 We’ll continue to expand in China, and we have four ships on order, with Oasis 4 next in line. 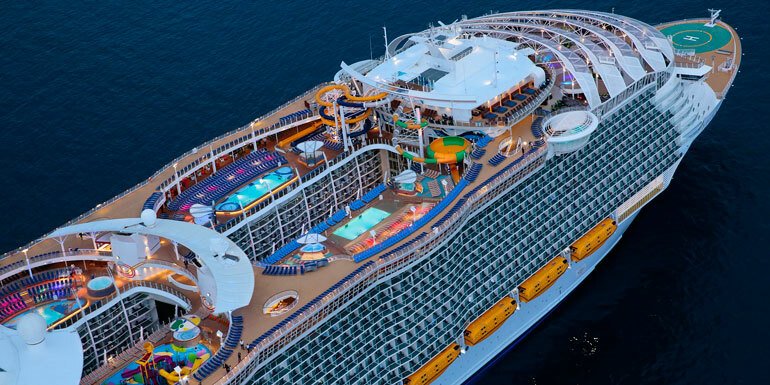 We’re excited to take cruising to the next level or 10. What is the one thing you want everyone to know about your brand? I can go on and on about the adventure and unexpected features you’ll find around every turn onboard Royal Caribbean ships, how we offer the perfect vacation for a family with all ages, and how the exceptional service, dining and entertainment is beyond what you could imagine, but the fact is that you need to see and experience the extraordinary to really believe it. What was one question you wished we had asked? 8 family members recently sailed on the Grandeur. We chose this ship since it was smaller & less walking for my handicapped husband. We found the entertainment was well below what we have come to expect on RCI as was the food quality in the main dining room. We realized too late that perhaps this was because there were 1/2 the passengers paying towards them. I emailed RCI but received no response. This wasn't really a complaint but info that we need before we book our next cruise. We are repeat RCI cruisers & have never been disappointed before.